SINGAPORE, Feb. 7, 2019 /PRNewswire/ -- In commemoration of the very first Extracorporeal Shockwave Lithotripsy (ESWL) procedure performed on 7 February 1980, Dornier MedTech (Dornier) has announced a global competition to honour ESWL Application Specialists around the world. Many people have heard of the urologist, or even the nurse – but few know or understand the important role of ESWL Application Specialists. Their skills are fundamental to the success of every ESWL treatment procedure, ensuring that patients can continue to go about their daily lives as soon as the next day after a successful treatment for kidney or urinary stones. Dornier's competition has been launched to inspire and shine a light on the knowledge, skills and contributions ESWL Application Specialists make to treating kidney and urinary stones on a daily basis. The competition seeks to bring out the life-changing and heart-warming stories of how ESWL Application Specialists have made a difference to the lives of patients, caregivers and healthcare professionals. The contest will be launched on 7 February 2019, which has also been announced as World ESWL Day, to honour the life and work of the many who have been involved with ESWL since its inception in 1980. 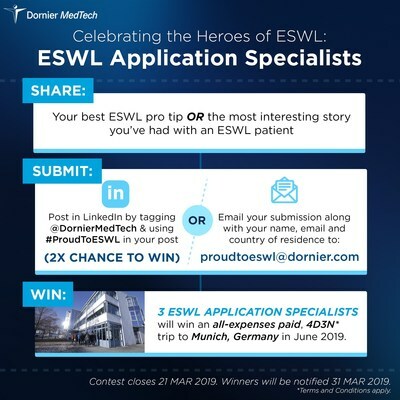 To participate, applicants will have to either submit their best ESWL pro tip or the most interesting story they had with an ESWL patient in LinkedIn by tagging @DornierMedTech and using #ProudToESWL or email to proudtoeswl@dornier.com. Three winners will be chosen based on their entry and win an all-expenses trip to Dornier MedTech's Headquarters in Munich, Germany, where they will visit the original Dornier manufacturing facility and heritage museum, interact and engage with key physicians and collaborators from Dornier MedTech to help shape the next generation of ESWL products, and tour the city of Munich. Interested participants can visit the Dornier MedTech LinkedIn page at https://www.linkedin.com/company/dornier-medtech/ to participate in the contest. ESWL is a commonly prescribed treatment option for treating kidney and urinary stones non-invasively. Annually, approximately 1 million procedures are conducted around the world. The treatment uses focused shockwaves (short pulses of high energy sound waves), which are transmitted to the stone through the skin. The stone absorbs the energy of the shockwaves and breaks into smaller pieces, which can then pass naturally with urine. ESWL treatment is one of the most patient-friendly solutions for treating kidney and urinary stones, due to its non-invasive nature, allowing a patient to be treated for their kidney and urinary stones without having to undergo surgery. The treatment continues to be the gold standard for stone treatment, making up over 40% of stone procedures worldwide. Dornier MedTech is headquartered in Munich, Germany, and is a full subsidiary of Accuron MedTech. Dornier is a medical device company focused on providing leading technology and improving life by delivering scientifically superior products and solutions to physicians, healthcare providers and research groups involved in urological care. As pioneers of the lithotripsy and a variety of surgical lasers, Dornier's 40 years of innovation and service have made it one of the most trusted MedTech companies in the industry. Accuron MedTech Group is one of the largest medical device companies in Southeast Asia. It is a vertically integrated medical device company and a global medical technology leader with a core focus in urology devices and services. Headquartered in Singapore, with operations in US, Germany, Spain, France, Italy, China, Malaysia and Japan, the Company serves millions of patients and physicians in about 100 countries worldwide. Accuron MedTech makes strategic investments in disruptive medical technology companies, strengthening its portfolio of healthcare solutions for customers around the world. For more information on Accuron MedTech, please visit www.accuronmedtech.com.